There are a whole range of mobility accessories for power wheelchairs and mobility scooters. Cushions and seat pads are a fundamental accessory for many wheelchair and mobility scooters users. Sitting for long periods of time can put people at risk of developing pressure sores and bruises. In addition, the vibration and heat from motorized mobility devices can contribute to sometimes causing some discomfort. Therefore a ‘cooling’ wheelchair pad or seat cushion is an important accessory for those who do spend extended time in a power wheelchair or mobility scooter. Foam seat cushions are lightweight and inexpensive, and come in a variety of densities and sizes to accommodate the wheelchair seat. The downside is that foam cushions typically last no longer than six to twelve months and need to be checked regularly to make sure that they are still providing the correct degree of comfort and pressure relief. These cushions are heavier than foams and are often used in combination with foam cushions. These materials are good at reducing heat and are encased by a protective cover so they are easily cleaned. The viscous fluid and gel construction give the cushion an incompressible nature. A Gel wheelchair cushion often uses a contoured non-deforming foam base or a flat, compressible foam base to improve the cushions ability to conform around the body. Air being compressible makes it an excellent support surface, except for its requirement of an impermeable membrane. This means that the efficacy and effectiveness of an air wheelchair cushion is directly related to the design of its container and correct inflation. Some designs encompass the body well while others do not. Some do dissipate heat well, all can handle moisture without harm and most will absorb impact loads. Air wheelchair cushions are adjustable, and they can be inflated to meet the needs of the user, but this adjustability also means that they must be maintained properly. An improperly inflated air cushion can be either too hard or too soft, and both are potentially damaging situations. You must ensure you carefully follow the manufacturers instructions for correct inflation. Although lightweight and waterproof, they are sometimes subject to leaks and punctures, and so should be checked regularly. 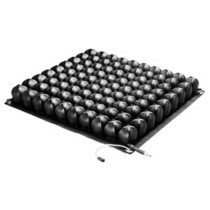 Cooling wheelchair pads are specifically designed to reduce heat build-up and moisture from underneath the legs and buttocks that occur from extended periods of sitting down. They are not dissimilar to cooling cushion pads that people use on car seats and office chairs. This type of chair pad can offer pain relief and therefore provide additional comfort for a number of hours. Prices for wheelchair cushions typically start at around $50 but can go up to as much as $400. 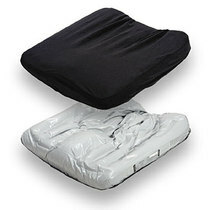 Similarly to Wheelchair Cushions, manufacturers also supply pads for Wheelchair Backs. These are most typically foam, but some specialty-customized models are available too. Prices for Wheelchair backs can start at around $40 but again can cost as much as $500 for those that include a Thoracic Support Panel in addition to a Sacral Support Panel. Another option for improving comfort, especially for those who may spend extended periods in a wheelchair. Armrest pads help alleviate discomfort from pressure ulcerations and bruises, and can usually be purchased for between $10-20. There are a whole range of pouches, packs and bags that fit onto a wheelchair to assist you with carrying items around. The type, size and siting of a carry pack will be determined by your own personal needs. Under-seat storage is also available. Prices for carry pouches can start from as little as $10 and go up to around $50. • A padded tray to help protect arms against developing pressure ulcerations or bruises. • Wheelchair trays with rims to keep pens, paper, eating utensils, and other items from rolling off the tray. • A flip-away half tray, which can lift up and out of the way during transfers, or for wheelchair storage. Prices for wheelchair trays typically range from between $100-200. There are a range of wheelchair chest harnesses manufactured by suppliers. I you do require a chest harness, it is important to ensure a correct fit as this is vital for ultimate postural support and a chest harness will be very comfortable when it is fitted properly. A 'positioning belt' is basically a seatbelt. They serve a similar purpose to a standard seatbelt and have a push button release and comfortable padding. Wheelchair positioning belts come in all sorts of fastener materials, such as metal, plastic and Velcro and more than one can be installed on a chair. In difference to a standard seatbelt, positioning belts secure your lower extremities into your wheelchair and are usually used in addition to a metal seatbelt. They can help prevent you feeling off-balance in your chair, and provide additional confidence and security. There are a range of useful accessories for your mobility scooter that may assist you to maximize the benefit of your scooter. Additional accessories such as walking stick holders, carry pouches and rain canopies, all optimize your experience with your mobility scooter. A walking stick or crutch holder means that you can easily carry your walking stick or crutches with you wherever you go. A mobility scooter pouch means you can carry your shopping or other items easier. This can range from a small pouch that will fit on the scooters armrest which is ideal for carrying car keys and a mobile phone, to a large bag that will fit on the back of seat and will hold a lot of shopping. Mobility canopies and capes are designed to protect you and your scooter in adverse weather conditions. These range from a simple waterproof cape that covers the user and the scooter, to a canopy that completely encloses the user and scooter from the elements. The mobility canopies are mainly designed for the larger road-legal scooters whilst capes will fit almost all models of mobility scooters. There are additional accessories that you may wish to consider for your mobility scooter. Such things as rear view mirrors, which can make reversing into a garage or shed even easier, especially if you struggle to turn your head. Also oxygen cylinder holders should you need to carry oxygen around with you.